Biting The Hand That Feeds You: EasyLunchboxes First Sale EVER! Planning to pack and eat healthier for the New Year? Need a good gift for a friend who wants to start packing waste-free lunches? Need extra EasyLunchboxes to keep in the car to make sharing popcorn at the movies or eating drive-thru meals easier? Or just want more on hand so you can pack several days' worth of lunches for each person in one go? Now is the perfect time to stock up, or try EasyLunchboxes for the first time! For the first time ever, all EasyLunchboxes products are on SALE! 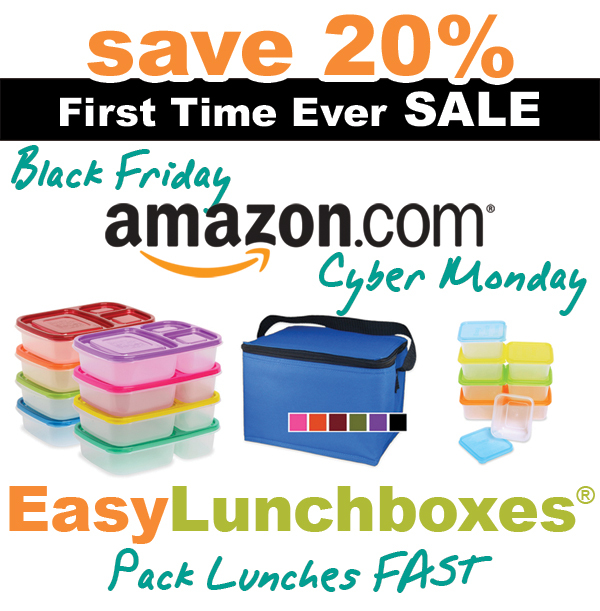 Through Monday 12/2/13, on Amazon.com only, EasyLunchboxes Classics, EasyLunchboxes Brights, Mini Dippers, and the Insulated Lunch Box Cooler Bags in all 7 colors (designed to hold the EasyLunchboxes horizontally) are all 20% off! All EasyLunchboxes products are eligible for free US shipping, and unfortunately they won't ship outside the US. The rest of you can buy direct from EasyLunchboxes.com, but sorry, no sale price there.